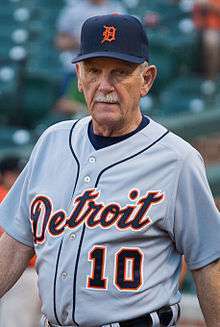 James Richard "Jim" Leyland (born December 15, 1944) is a retired Major League Baseball manager. He currently serves as a special assistant to the Detroit Tigers and is the manager of the United States national baseball team. Although he has moved on in his career, Leyland still keeps his home in the Pittsburgh suburb of Mt. Lebanon, Pennsylvania where he met his wife Katie and has raised two children, Pat and Kellie. Both attended Bishop Canevin High School. One member of Leyland's coaching staff while with the Pirates, Terry Collins, the manager of the New York Mets, wears number 10 to honor Leyland. In the 2012 postseason, Detroit defeated the Athletics in a five-game ALDS and returned to the World Series following a sweep of the New York Yankees in the American League Championship Series. Detroit was swept in the 2012 World Series by the San Francisco Giants. They were shut out twice, the same number as in the entire 162-game regular season, and had a team batting average of .165. On April 15, 2016, Leyland was named the manager of Team USA at the 2017 World Baseball Classic. His son, Pat Leyland, was drafted by the Tigers in 2010 and has also played in the Seattle Mariners organization. ↑ Dvorchak, Robert (November 2, 2004). 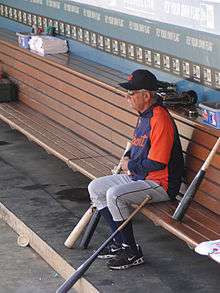 "Leyland awaiting Phillies' decision". Pittsburgh Post-Gazette. ↑ "Drama and nostalgia hold the front row seats at stadium exit". Old.post-gazette.com. 2000-10-02. Retrieved 2013-07-07. ↑ Collier, Gene (April 2, 1988). "Double Play: Katie Leyland says teaming with Jim worth any sacrifices". The Pittsburgh Press. Retrieved March 27, 2016 – via Google News Archive Search. ↑ Tehan, Patrick (October 13, 1991). "Sunday Briefing". The Pittsburgh Press. Retrieved March 27, 2016 – via Google News Archive Search. ↑ Rumberg, Howe (November 23, 2010). "Terry Collins introduced as Mets' manager". Yahoo! Sports. Associated Press. Retrieved December 12, 2010. ↑ Rubin, Adam (December 8, 2010). "Leyland praises Collins". ESPNNewYork.com. Retrieved December 12, 2010. ↑ Rubin, Adam (November 23, 2010). "TC on No. 10". ESPNNewYork.com. Retrieved December 12, 2010. ↑ "PLUS: BASEBALL – ST. LOUIS; Leyland to Scout". Nytimes.com. December 1, 1999. Retrieved October 7, 2011. ↑ "Tigers pounce quickly, hire Leyland to manage". ESPN.com. Associated Press. October 4, 2005. Retrieved October 16, 2013. ↑ "Austin Jackson's 4 hits, Rick Porcello's pitching lead Tigers over Royals". espn.com. Retrieved 3 May 2012. ↑ "Tigers shut out Twins to win Central title". Reuters. September 26, 2013. ↑ "Leyland steps down after eight years with Tigers". MLB.com. October 21, 2013. ↑ "Detroit Tigers". Detroit Free Press. ↑ Fenech, Anthony (April 15, 2016). "Jim Leyland to manage Team USA in World Baseball Classic". Detroit Free Press. Retrieved April 15, 2016. 1 2 3 4 "Jim Leyland". Baseball Reference. Sports Reference LLC. Retrieved December 5, 2014. ↑ "Detroit Tigers prospect Pat Leyland follows footsteps of father, Tigers manager Jim Leyland".